Out now is the brand new edition of the Snoe & Snolleke album ‘De zwarte draak’ which was first released in album format in 1993, albeit in an adapted coloured version, by the Standaard Uitgeverij. For this version the people behind the Fenix Collection by Brabant Strip vzw were able to get hold of the original newspaper prints published between October 12 1953 and January 30 1954 included. This also means that they were able adding 4 strips which were missing in the 1993 album version! 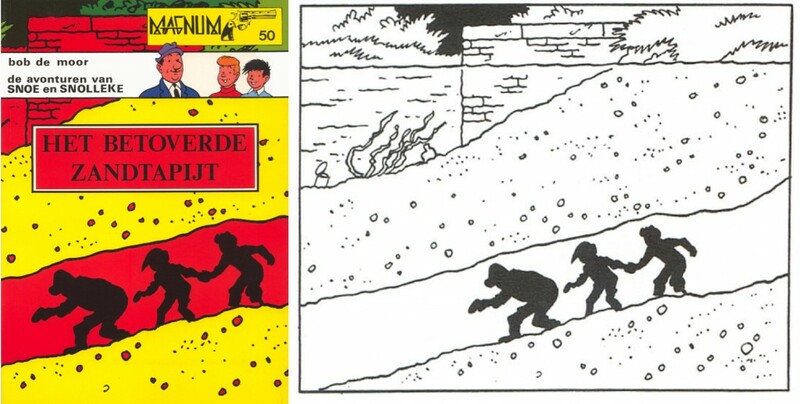 And not only that, as we have several times indicated already, the 1993 version was in a kind of unreadable Dutch, plus it was missing a lot of the original black parts in the drawings due to the fact it was adapted for being printed in colour. But there’s more to this version, because unlike the 1993 version, this 2015 version holds a cover which although based on the 1993 version (which was originally drawn by Bob De Moor), this time was executed by his son, Johan De Moor. If you look closely you’ll see some differences, for example some of the pen lines (on the chest of the beheader) differ a little bit from Bob De Moor‘s. 2016 will see some more restored work hitting the shop shelves as the fine people behind Brabant Strip vzw are also preparing the release of the full uncensored version of “Het Geheim van Vulcania”, a black and white album version which so far has only been available in a not so high quality pirate version. For the fans of the older work of Bob De Moor, this album is an absolute must have! You can get hold of it in every better comic store in Flanders and The Netherlands. A few months ago we wrote that the team behind Brabant Strip had been able to find the original newspaper clippings of the 1954 Snoe and Snolleke story “De zwarte draak” (“The black dragon”). We now can confirm that the re-edition – in its complete version including the 4 missing strips from the Standaard Uitgeverij version – will be released as Fenix 110 by the end of 2015. We’ll update asap on what the cover artwork will be based on. Notice the difference in language in both versions. This re-edition is important for many reasons. 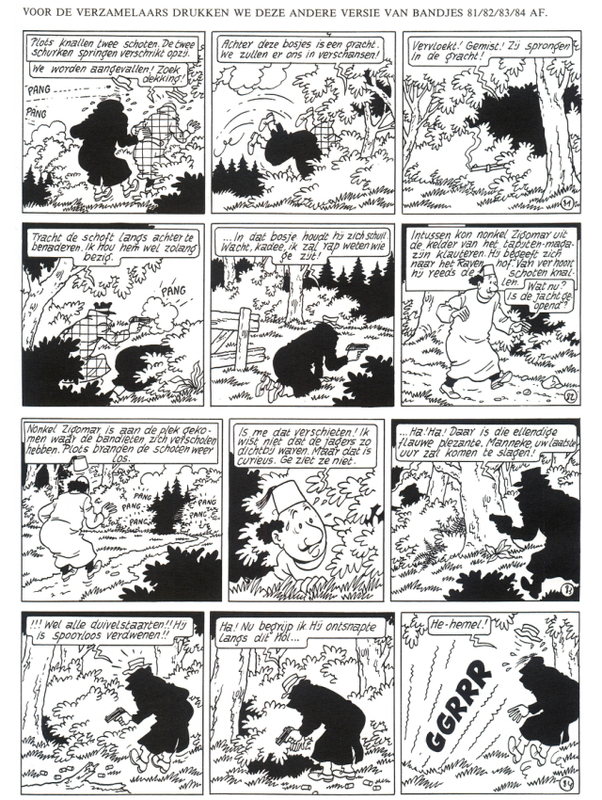 The original version of this story as published in De Nieuwe Gids (and related newspapers) from 12 October 1953 until 30 January 1954 was in a flemish dutch. That very cosy language got annihilated when the Casterman and Standaard Uitgeverij re-editions replaced it by a dutch which was way too much ‘dutchified’. Both editors (and especially their translator) seemed to have forgotten that Snoe and Snolleke were Flemish and not Dutch to start with. Next, no less than 4 strips were missing in the first album edition. Brabant Strip will edit this album in black & white in its Fenix Collection including the 4 missing strips. 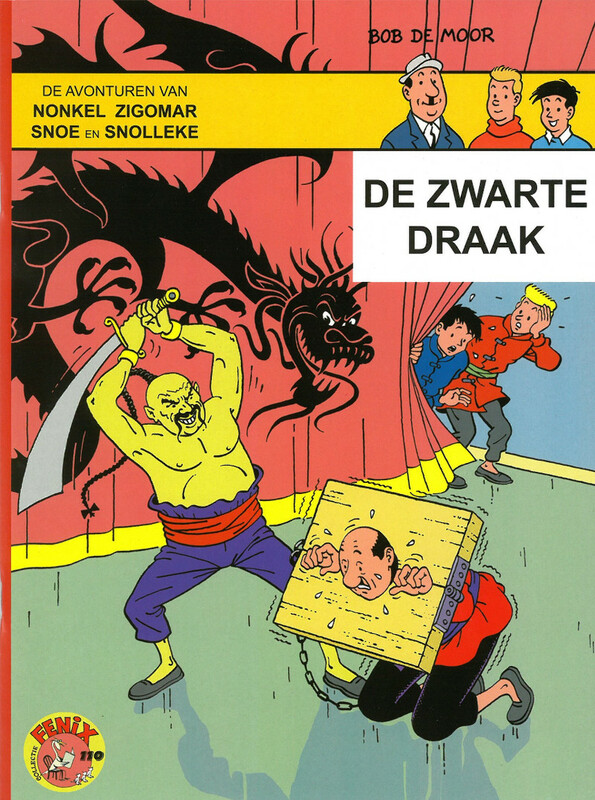 The re-furbished “De zwarte draak” was originally supposed to be published by Casterman in 1989, but in the end it was Standaard Uitgeverij which would edit it in 1993. We can also confirm that the newspaper clippings from the “Het Geheim van Vulcania”, the follow-up album from 1954, have also been retrieved. Also this album will be released in album format via Brabant Strip in 2016. In 1985, the publisher De Dageraad would release Magnum 50, aka the Snoe & Snolleke story “Het Betoverde Zandtapijt”. This was the 10th story of the series which originally was published in Nieuws van de Dag from May 26 1954 until September 11 1954. The story would only be released once in album format, namely in the Magnum series, and would also be the very last Snoe & Snolleke to be released via De Dageraad (which by then had already slowed down its publication rhythm). The cover was an enlarged frame from strip 174 with some extra ‘retouches’. But there are 2 things that are quite interesting about this album, apart from a lot of cheek in tongue ingredients: the cover and the presence of 4 redrawn strips in the back of the album as a (nice) extra. Let’s first check the cover. At first sight you’d think that Bob De Moor didn’t really bother to make an appealing cover, however, it’s actually not a cover drawing at all, but instead the enlarged first frame of strip 174 completed with ‘vivid’ colours plus – you have to look really well – some extra ‘retouches’ here and there (check the bushes in the top center and the brick right under ‘Snolleke’). Did Bob De Moor add those changes? We doubt it. The album itself says that the albumcover was created by Bob De Moor… and Toine Cools, probably the lay-out guy who did his best to find a decent cover since De Moor obviously didn’t provide a drawing. We asked Johan De Moor if he remembered why there hadn’t been a normal cover drawn for the album, but he had no idea. 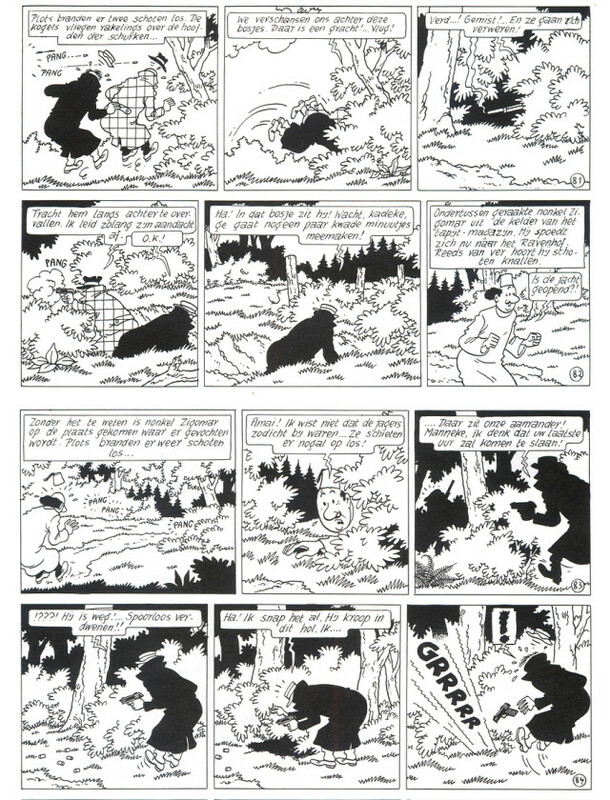 The redrawn strips 81-84 which were added as extra in the album. Now let’s jump to the second odd thing in this album. In the back you find a redrawn version of the strips 81 till 84. Graphically it’s not very different, although the way the shoes are drawn clearly indicate this is Bob De Moor anno 70-80 at work. But if you look at how the action is shown, a few things have changed. 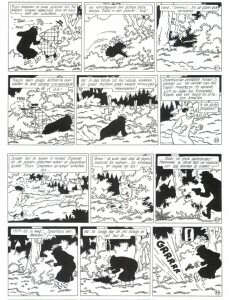 Case 1 of strip 81 sees the action inverted (creating a more readable composition), the same happens for the 2nd case in strip 83 where Uncle Zigomar is now looking to the right (again creating a more readable composition). At the end of strip 84, the scream now goes outwards the page, again to keep the flow of the action going in the correct reading direction. 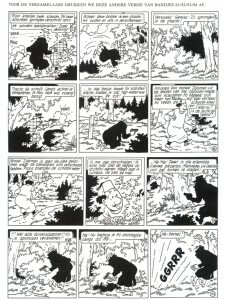 There is a little bit less black used here and there but there’s also some added, see for example the 2nd frame in strip 81. A version meant for a coloured version of the album? 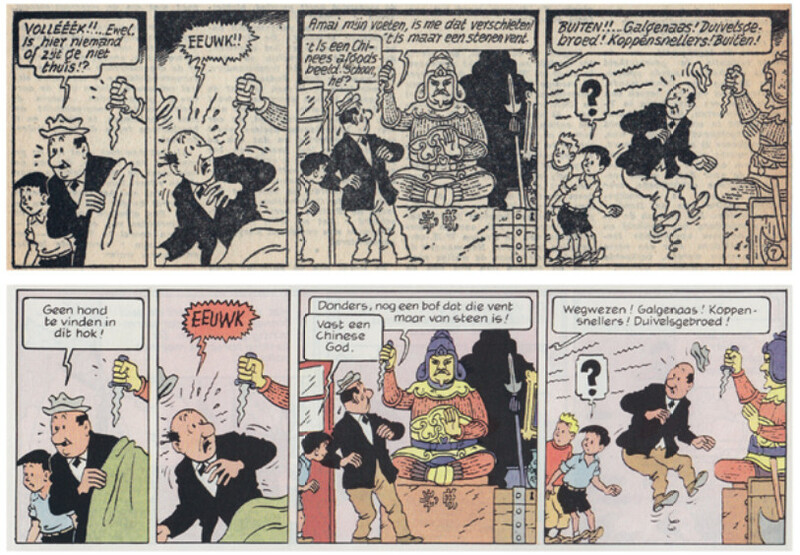 Unlikely, Bob De Moor would never redraw complete pages if there weren’t obvious reasons (also see these articles on “De sigarillos van koningin Thia” and “Het Mollenrijk”). The page we present you here had no reason whatsoever to be redrawn except for some compositional reasons. The old strips 81-84, here recut to be presented as a page. Bob De Moor would start work on the re-edition of the Snoe & Snolleke albums via Rijperman and Casterman around that time. Weirdly enough, the album would never see a reprint via Rijperman, Casterman or De Standaard Uitgeverij. Good news reaches us from the Brabant Strip headquarters. 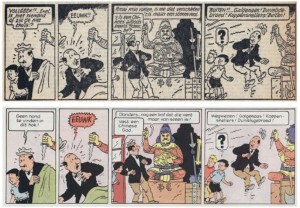 The team behind Brabant Strip have been able to find the original newspaper clippings of the 1954 Snoe and Snolleke story “De zwarte draak” (“The black dragon”) during a foray at the Vossenplein in Brussels. This re-edition is important for many reasons. First of all, as you probably know, the original version of this story as published in De Nieuwe Gids (and related newspapers) from 12 October 1953 until 30 January 1954 was in a flemish dutch. That very cosy language got annihilated when the Casterman and Standaard Uitgeverij re-editions replaced it by a dutch which was way too much ‘dutchified’. Both editors (and especially their translator) seemed to have forgotten that Snoe and Snolleke were Flemish and not Dutch to start with. Next, we also showed you in the past that a lot of drawings for these re-editions were adapted because they were printed in colour. A move which makes sense. Also, some drawings were completely changed as you can see here and in the case of this upcoming album, no less than 4 strips were missing in the final re-edition (it’s not sure why these 4 strips were not included, perhaps Bob De Moor didn’t find them useful enough or the originals were missing or it simply wouldn’t have fit in the 46 pages that were planned for the album version – we’ll update this when we find more info). Brabant Strip will edit this album in black & white in its Fenix Collection including the 4 missing strips. On the left you can see an example of the newspaper clipping versus the version as edited by Standaard Uitgeverij. 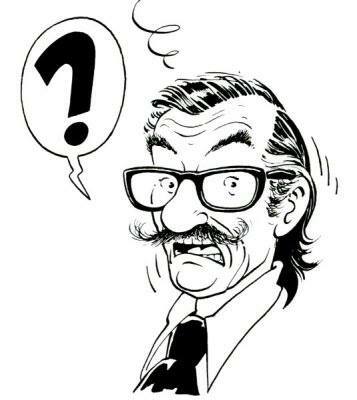 Note that the re-furbished “De zwarte draak” was originally supposed to be published by Casterman in 1989, but in the end it was Standaard Uitgeverij which would edit it in 1993. 22 years later we now will finally also have the original version in black & white! And that’s not all, it seems like it that also the newspaper clippings from the “Het Geheim van Vulcania”, the follow-up album from 1954, have been retrieved. Also these ones will be released in album format, in 2016. Until now only a poor photocopy bootleg version of the album was being sold here and there.